Monday – Let imaginations run wild with pretend play at the Playseum in Bethesda. Little ones can visit the pet shop, shop in the makret, dress up in costumes, enjoy story time, and do some art projects — all possibilities in the many themed rooms and crafts areas. Hours are 10am – 5pm. Admission is $9/person. Tuesday – Visit one of DC’s most tried and true for kids: The National Museum of Natural History. With exhibits to indulge all kinds of interests, you really can’t go wrong. 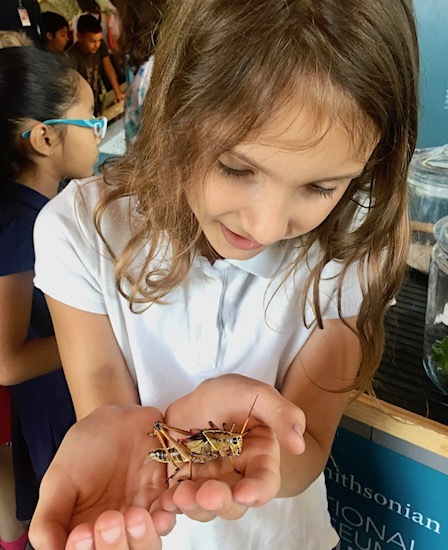 Gawk at the beasts in the Hall of Mammals, hold live creatures in the Insect Zoo, check out marine life in Sant Ocean Hall, learn about early humans and see what you’d look like as a Neanderthal, get hands on in Q?rius (or Q?rius Jr. for little ones Tues – Fri). KFDC Tip: On Tuesdays, you can get free entry to the Butterfly Pavilion, and I recommend getting tickets for it when you arrive, since entry is timed, and yours may not begin right away. Admission to the museum is free, the Butterfly Pavilion is $7.50/adult, $6/child. Museum hours are 10am – 5:30pm. Wednesday – Head to the Hirshhorn for STORYTIME from 10-11am. During this session, examine abstract paintings by Charline von Heyl and enjoy a read-aloud of The Snowy Day by Ezra Jack Keats. Following the story, stay and play with Snowy Day-inspired materials. Be sure to check out the Pulse while you’re there — the exhibit will capture your heart. Admission to all of it is free. Thursday – Explore and play, indoors and out, at Potomac Overlook Regional Park in Arlington. Hike the short trails and let the kids romp on the playground. Then visit the nature center where you can see turtles, snakes, and other creatures and learn about the area’s natural environment. Hours are 10am – 5pm, Tuesday – Sunday. Admission is free. In the evening, attend the annual Norwegian Christmas Tree Lighting at Union Station. The celebration will also feature lots of live entertainment and a visit from Santa and Mrs. Claus. Festivities begin at 6pm, and admission is free.